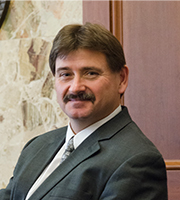 Attorney Danny Bank joined Capital University in 1990. As a clinic staff attorney, Mr. Bank's other responsibilities also include overseeing and supervising the work of students in the General Litigation Clinic and the Child Custody Unit of the Family Advocacy Clinic. He was admitted to the Ohio Bar in 1990, the New York Bar in 1992, the Federal District Court for the Southern District of Ohio in 1992 and the Sixth Circuit Court of Appeals in 1994. Mr. Bank is a member of the American, Ohio and Columbus Bar Associations, and he serves on the Delivery of Legal Services Committee of the Columbus Bar Association.